Ontario Motor Sales | Blog | Home of the $15K Giveaway! 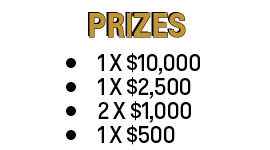 OMS: Home of the $15K Giveaway! Remember that time we gave away $10,000? Ontario Motor Sales is pleased to announce the return of the $10K Giveaway—only this time, we've decided to make the program bigger and better than ever before. Now, we are pleased to confirm the launch of the $15K Giveaway! Deep in our management meetings, our team put their heads together and thought: how can we make the $10K Giveaway an even better program for even more people? With that in mind, we also want to share just how easy it is to be entered in this contest. Beginning May 3rd, 2016, the first 300 new and pre-owned vehicles that we sell will all be eligible for one ballot in our massive draw. When vehicle delivery is taken, we add a tick to our counter and put a ballot with the purchaser's name on it in the box. When our counter hits 300, we will announce the date and time for our exciting draw for our five cash prizes! With 1 in 60 odds of winning a cash prize, Ontario Motor Sales is a truly great first stop if you or a friend are considering purchasing a new vehicle soon. Hurry in—our tally counter is already going! Five lucky customers will win some serious cash... will one be you?